Meet Prakash who really needs a bone marrow transplant at a cost of $25,000! Prakash comes from a farming family. There is just him and his elderly father. Their income is low and Prakash went to Malaysia to work as a labourer and had been there for two years. He began to feel unwell and when he returned home to visit his family he was diagnosed with aplastic anaemia. This is a condition which develops when damage occurs to your bone marrow, slowing or shutting down the production of new blood cells. Bone marrow is a red, spongy material inside your bones that produces stem cells, which give rise to other cells. Stem cells in the bone marrow produce blood cells — red cells, white cells and platelets. Prakash was taken to hospital in Dharan. 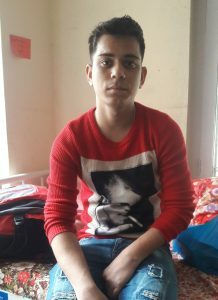 It took two weeks for his condition to be diagnosed and then he was transferred to Kathmandu which is the only place where the treatment he needed– a bone marrow transplant – is available. The hospital he was admitted to advised him that a bone marrow transplant would cost approximately US$25,000! He was referred to NHEDF who sadly, cannot afford to fund a bone marrow transplant. Even though he does not require rehabilitation, physiotherapy or nursing care, NHEDF decided to admit him as he simply comes for his transfusion and Samrat, NHEDF’s Director was also touched by his story…. Prakash’s only other option is a blood transfusion every 10 days which NHEDF organises on his behalf.